I set out to experience something new on my recent hunt in the Kwazulu-Natal province of South Africa. 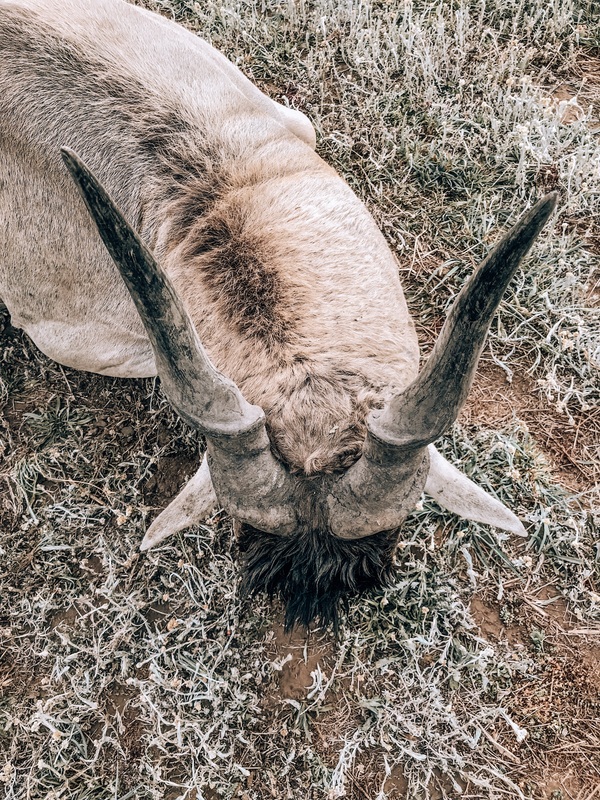 I would be pursuing free ranging Cape Eland which are also referred to as “Berg” Eland. The word “Berg” is an Afrikaans word which translates to “mountain” in English, hence mountain Eland. 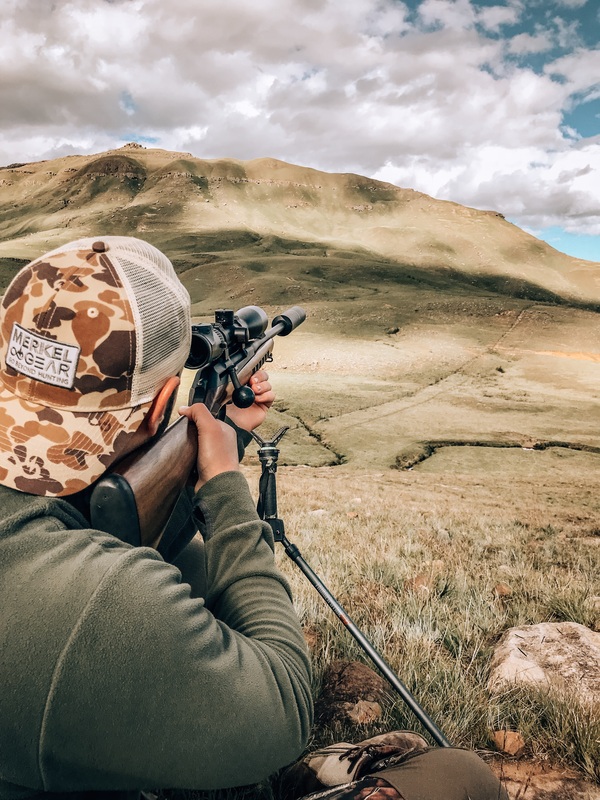 They have earned this title as these herds dwell higher up in the mountains and only come lower down at certain times of the year, in search of greener pastures, which makes hunting them more of a possibility. In the same breath, a hunt like this can certainly be a hit or a miss, as these animals are not simply contained by anything and move between areas as they please. I was hunting in the Underberg area which is part of the famous Drakensberg mountain range. The particular property I was hunting was mainly agricultural land riddled with game fences to keep in the cows and horses but also to keep out these big herds of Eland. These fences, however prove no obstacle for the Eland as Mark, my PH, and I watched them jump over the fences effortlessly as well as go through holes where they had broken through. 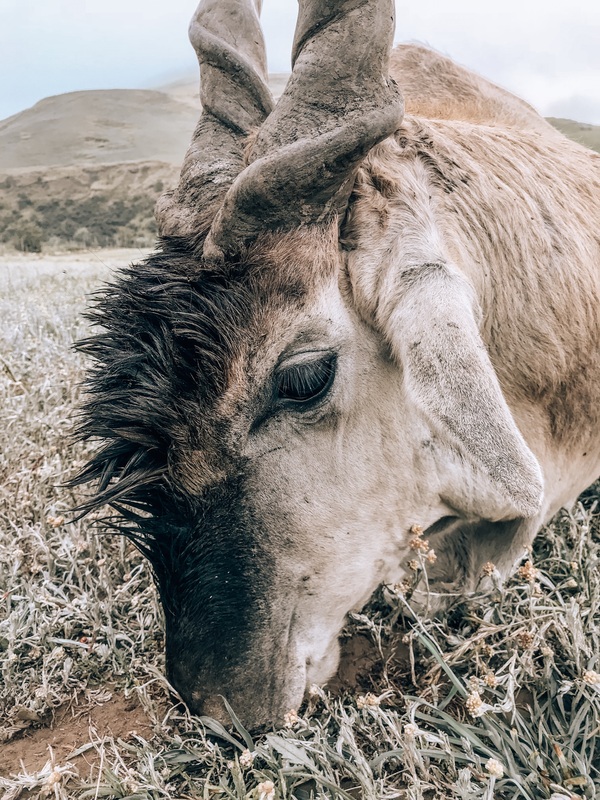 On the first evening of arrival, Mark took me for a drive through the one land where he had spotted some Eland while driving along the dirt roads. We saw well over eighty Eland grazing on our brief drive using the vehicles headlights and began making plans for our morning hunt. Mark had told me that they would be heading straight back up into the mountains from the early hours of the morning and that we should try to intercept them in the hopes of finding a suitable bull to hunt. After setting sight on that herd, I could barely contain my excitement for the morning and wondered to myself how I would sleep, however after having driven almost seven hours, sleeping proved easy. My alarm went off at 3:45am and I was more than eager to see what the morning held for us. Mark picked me up and we headed to the land where we had seen the herd and began hiking our way up a smaller mountain side. It was not long before we spotted some of the herd moving higher up and we began to move faster as we were concerned that we might have been too late in our prospect of intercepting them. As we reached a plateau we could see that much of the herd had already made their way up but there were many still trailing behind, getting in the last bit of grazing ahead of their journey back up into the mountains. We had not seen any mature bulls in that group either, making us hopeful that he was still making his way up too. As we surveyed the smaller valleys around us we spotted a big-bodied bull in a small field below. His massive size, dark ruff and beautiful horns made him immediately stand out from the rest and spotting him brought on an immediate rush and quickened our pace. He was occupied with an Eland cow on the other side of a boundary fence as the Eland rut had just begun. This gave us the perfect opportunity to move back down and stalk in closer. Our stalk started off rather slowly as we had to avoid bumping into the Eland still moving up towards the mountains, but we managed to do so without spooking too many and without gaining the attention of the bull either. We were able to get to a distance of 220 meters where we confirmed that this bull was definitely what we were after. I found a comfortable shooting position off of a nearby rock and when the time was right, my Merkel Helix spoke. The bull did not go further than 40 meters and the hunt was over by 5am. I felt a feeling a pure joy but also a sense of great relief knowing that my shot was well-placed, putting the bull down swiftly. 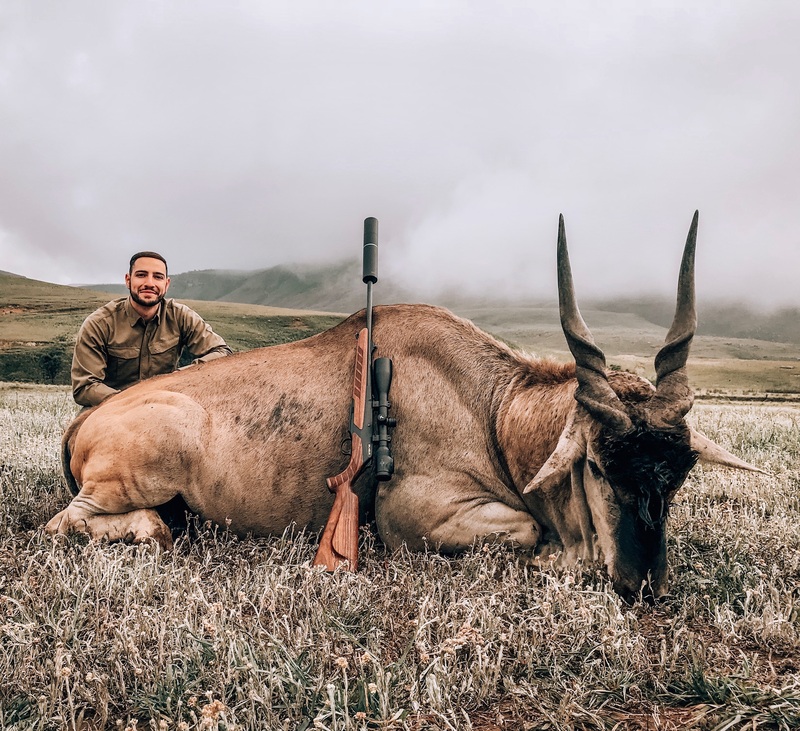 This hunt was a truly incredible experience and I was able to spend a few more days just observing the movements of these free ranging Eland herds up in the mountains, giving me an even fuller experience too. Although this was a first-time experience for me, I know that it will not be my last.